We picked up Pablo’s mom, TerryLynn, and her friend, Vicki from the airport and drove to Naples while they caught us up on their experiences they had on the way here. As we listened to their story of a Taxi driver who helped them find their way when they were running late, were lost and feeling hopeless I thought of the countless times we’d had very similar experiences. It’s been incredibly rewarding to witness how kind people can be to two travelers in need of help. Over the past few months we’ve both become comfortable approaching anyone and attempting to communicate with them despite the language barriers. We’ve also become very skilled in charades since there were some, surprisingly not too many, places where people didn’t speak a lick of English. We arrived at our Airbnb in Naples and were immediately impressed. The nice thing about booking as a group with Airbnb is it’s easier to find nice places for cheaper, and this place was nice and authentic. 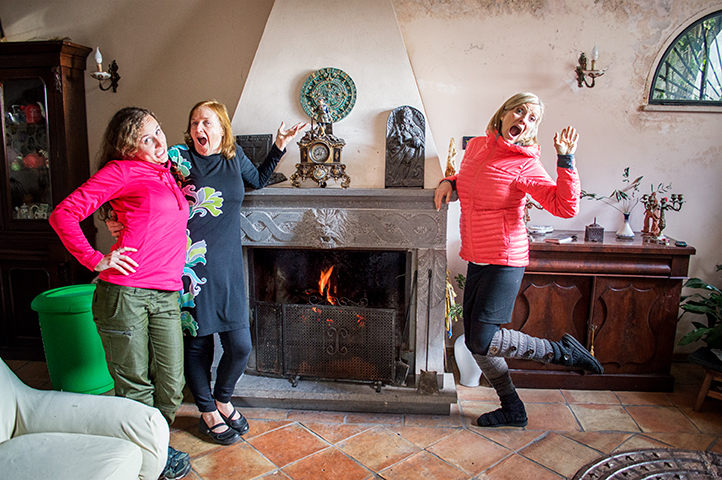 It was an extremely old Tuscany styled home with a grand family room where our beds were set up by the fireplace. The family who owned the house had lived in it through several generations. They showed us their large vineyard and garden constantly handing us fresh fruits to try while they told us of the gardening knowledge that had been passed down through the family. We ended the day by driving into the heart of the city, which was busy and we spent most of the time either stuck in traffic or fighting for a parking spot. I was only there for the pizza that I’d heard was “the best in the World”. It in fact was. Everything about it was amazing- the fresh runny sauce, the authentic cheese, the soft crust… My stomach growls just thinking of it. I would go back just for that pizza. As we got ready to settle in for the night there were fireworks from the city as an Easter parade was passing through. 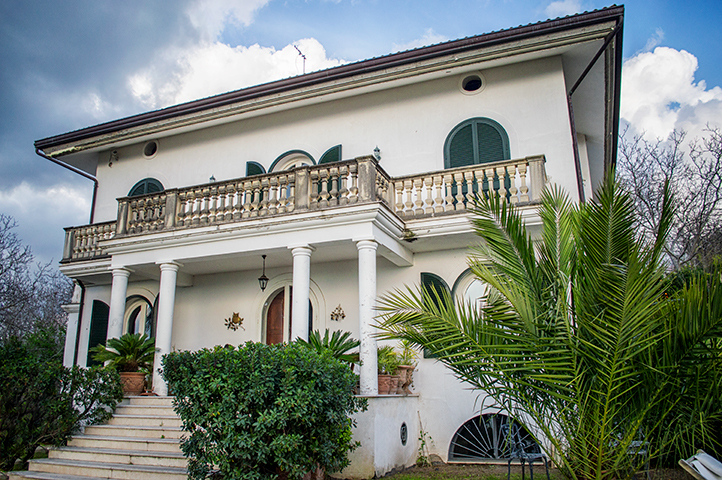 The house was on top of a hill with a perfect view of the city and Mount Vesuvius. Pablo started a fire as we settled in and fell asleep by the fireplace all cozy and warm. The next morning our hosts had a breakfast ready for us, the table filled with with their own grown fruits, meats and to my amusement – pasta pie. We gave hugs to the family who had treated us as their own and headed to Pompeii. 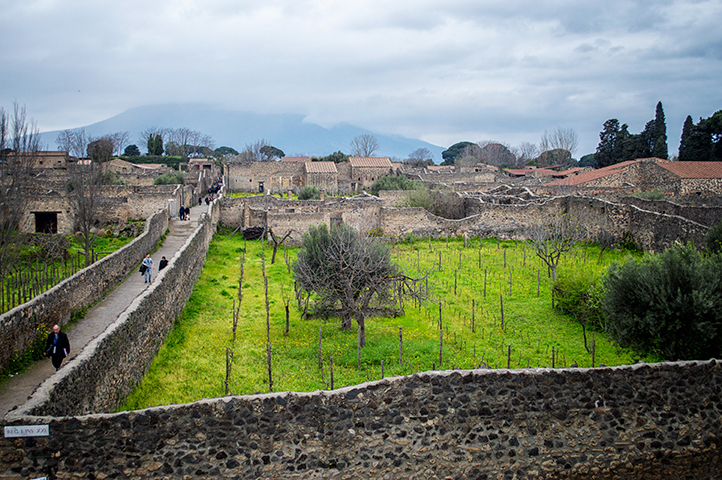 For those who don’t know the history of Pompeii here’s a quick recap: Pompeii was a thriving Roman city full of people partying and having a wicked good time. The year was 79 A.D. and the monstrous Mount Vesuvius erupted, devouring everything in it’s path and sealing it in time with ash and pumice. Fast forward to today’s time and tourists can walk through the same streets and buildings of 79 A.D. that have been preserved by the catastrophic eruption. Literally, there are live statues of people in horrific positions as they realized their fate. Mount Vesuvius is still considered highly dangerous and is due for an eruption any day. 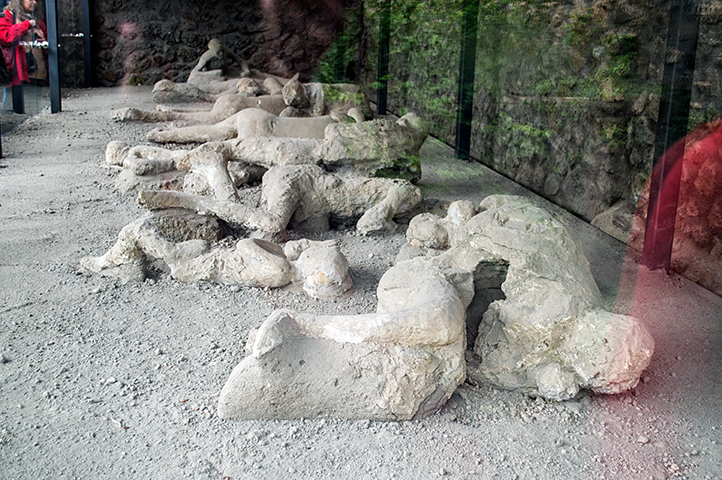 When the volcano erupted in 79 A.D. there was an estimated 20,000 people living in Pompeii. Today there are over 2.5 million people… yikes. 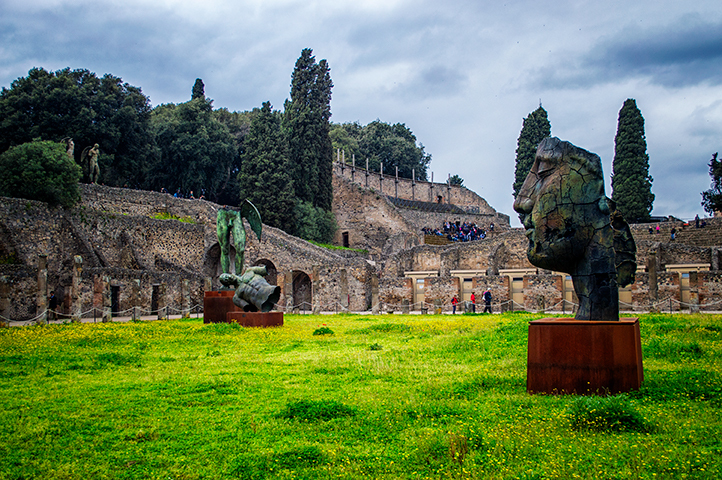 Pompeii is pretty spectacular, but I wouldn’t want to join the statues. 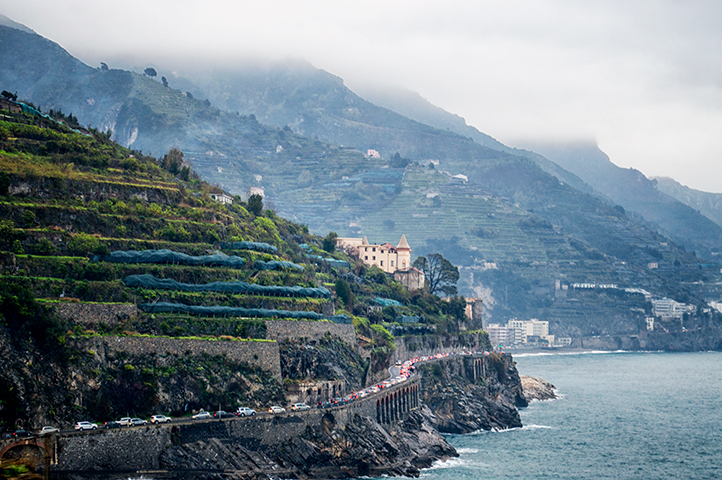 We left Pompeii and the chance of being witness to another eruption, and drove to the Amalfi Coast. Although the skies were dark and it lightly rained on us a good portion of the drive the coast was still beautiful and had us stopping every few minutes to take it in… although we didn’t really have a choice about stopping since traffic was literally stop and go in the towns. Pablo got to slowly inch the car forward as the rest of us got out or rolled down windows to take pictures. We stayed that night in a hotel (rare occasion for us!) and recharged for the next day. The hotel wasn’t super fancy, but it was great having a place that provided free soaps and I stocked up. After a nights rest we woke up to tackle our next item on the itinerary: driving to the enrapturing island Sicily. Stay tuned!